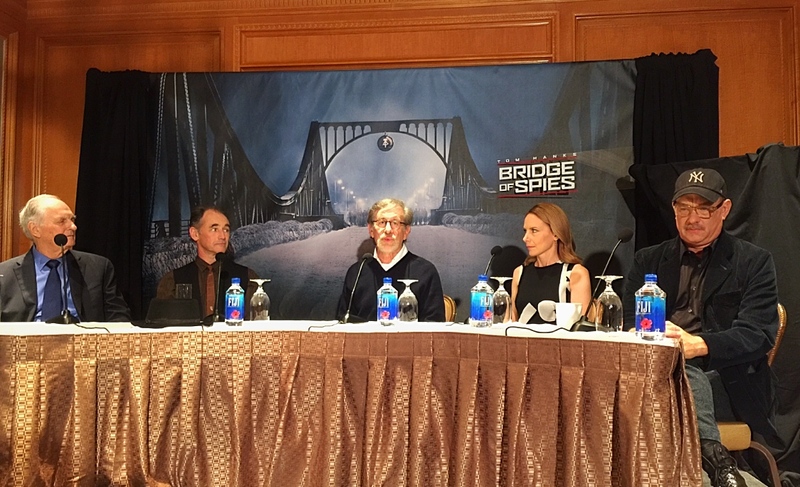 Earlier this month I was invited to attend a press junket for DreamWorks Pictures’ Bridge of Spies. I had the chance to screen the movie as well. My full review will be posted here this coming Friday. 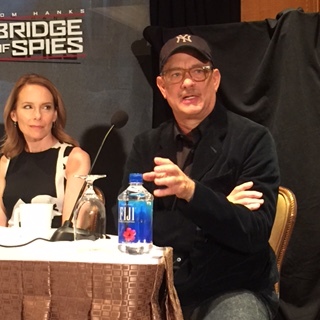 The cast members in attendance at the junket were Director, Steven Spielberg, Tom Hanks, Amy Ryan, Alan Alda, and Mark Rylance. To say that I am a huge fan of both Steven Spielberg and Tom Hank would be an understatement. 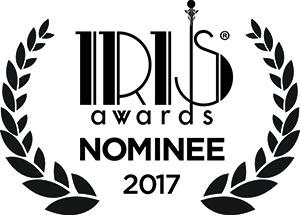 So, I was thrilled to be part of a Q & A with this amazingly talented group of people. 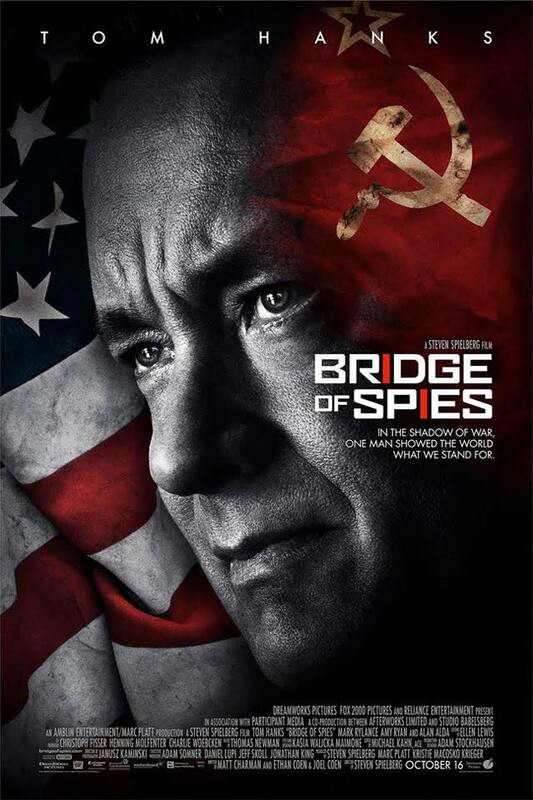 Bridge of Spies tells the story of James Donovan, (played by Tom Hanks) a Brooklyn lawyer who finds himself thrust into the center of the Cold War when the CIA sends him on the near-impossible task to negotiate the release of a captured American U-2 pilot. Now, my retention of High School History is limited at best. 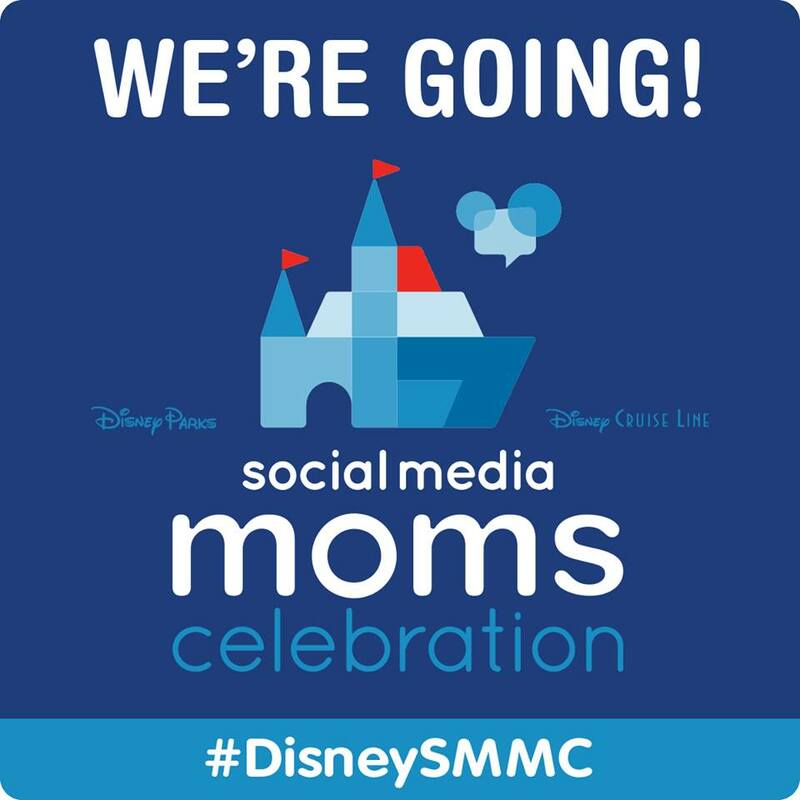 But, I can honestly say I’d never heard about this event taking place and I was fascinated by the story. 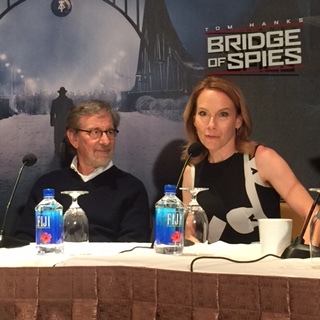 Steven Spielberg is a master at bringing pieces of history onto the screen. 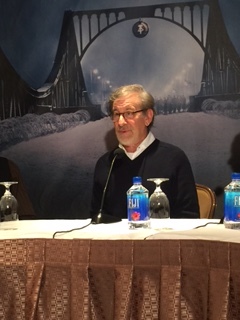 I was interested in what went into the making of this film and how this story came to the attention of Mr. Spielberg. When asked why he got involved in this story, I was surprised to find out that he had not known about it either until recently. It really is such an important piece of history and very relevant in today’s political climate as well. Tom Hanks, who has played many heroes in his film career, was asked if playing a real life American hero in the movie was part of a bookend or another chapter in men he has played before who are similarly heroic? “I don’t view this as a bookend to anything because every movie starts fresh and has to exist on its own auspices. The interesting thing that happens when you play somebody real is you – you have to have meetings with them, if they’re alive, and you have to say, “Look, I’m – I’m going to say things you never said. I’m gonna do things you never did. And I’m gonna be in places you never were. 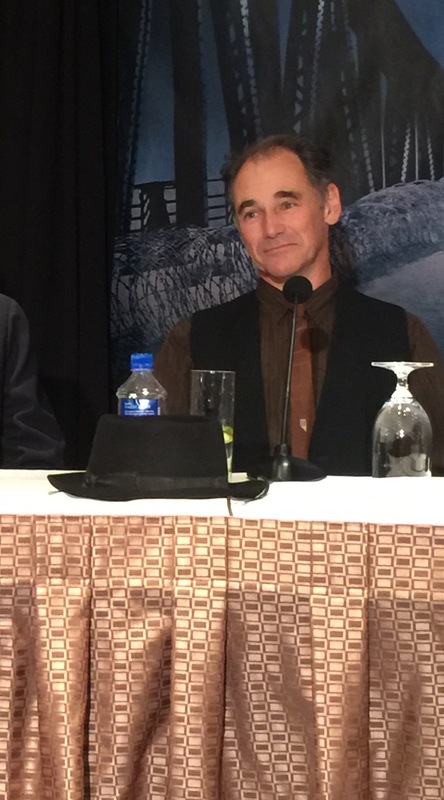 Mark Rylance, who plays Rudolf Abel, a Soviet Intelligence officer being held by the United States government, was asked how he came to be cast in the movie and what his audition process was like. 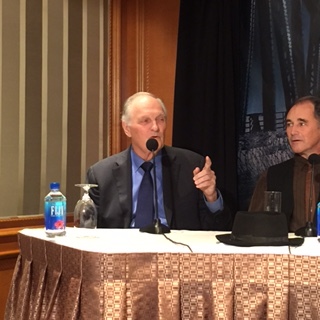 Alan Alda, ( another of my most favorite actors…who will forever be Hawkeye Pierce to me) and Amy Ryan were asked what showing the work life and the home life does to enhance the story of this negotiation, and this trial and what their characters contribute to the overall story. “Well, I think that’s what’s so fascinating is, you know, this is a happily married couple, both devoted to their family. And I love that Mary is so outspoken and protective of that. And yet she knows he’s also involved in some other greater good that she’s not quite sure. Yet here’s a man who, even loving his family, and as protective, can still set forth for the greater good; has the foresight, can push apart fear that the majority of the country is feeling at this time, and not able to make maybe such a strong decision of – between right and wrong, but he does. And she knows that. I was privy, before we started filming, to family photographs. 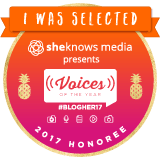 “I loved how they were able to develop the home life so believably, so un-movie-like. But like two people who are running a family together – that that gave resonance. I thought, to the moment where I said to him, “Don’t do this. Think about your family. Think about what it’s gonna cost them.” That really would have been a hollow argument if you hadn’t experienced their home life in such an authentic way. And I think that’s important to the whole thrust as a movie, so you can understand what these people were going through, what they were thinking when they did and said things that were not in the interest of justice, but other considerations. And you could believe in their point of view a little better, which brought you back to the real drama of this situation at that time.